Hawksbill sea turtles are critically-endangered throughout their range. This species has been harvested for centuries to feed demand for its beautiful shell, referred to as tortoiseshell, which is used to make jewelry, souvenirs and other decorative items. Hawksbills utilize coral reef habitats and were once very abundant throughout the Caribbean. Sustained harvesting has reduced their numbers by more than 95 percent; however, long-term conservation efforts are beginning to show promising results. Unfortunately, many small Caribbean island nations still allow the legal harvesting of this species, despite an international ban on all trade of products made from hawksbills. For the last 10 years, Sea Turtle Conservancy (STC) has been working with local communities to monitor and protect a small but growing population of hawksbills in the West Indies, particularly in Nevis and neighbouring islands. For generations, Nevisians and other local people of the Caribbean have used sea turtles in an unsustainable manner. Reversing this tradition will take a sustained effort to change attitudes and behaviour. It will also take efforts to replace the income generated by harvesting turtles with sustainable activities such as ecotourism. 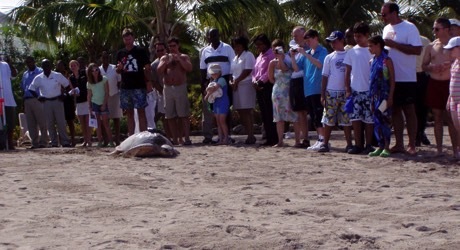 This project is addressing a variety of critical needs by continuing to monitor the turtle population and collect vital information about its movement between islands; raising awareness about the species and its threats among communities throughout the West Indies; involving young people in the project in order to increase conservation stewardship; and promoting ecotourism in the very communities where it is needed to replace the harvesting of sea turtles. The overall project objective is to support the protection and recovery of endangered hawksbill sea turtles in the cluster of Western Caribbean islands that makeup the West Indies. Particular attention will be given to the island of Nevis, where a small but growing population of hawksbill turtles needs further study and protection from a variety of threats. 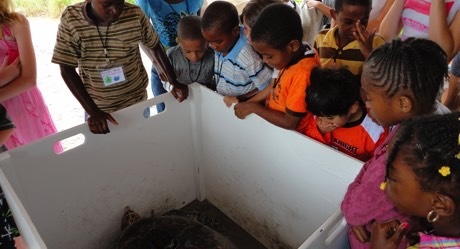 In addition to the collection of important biological information about this population of turtles, the project will support training and stewardship activities that involve young people from the local community. It is still legal to harvest sea turtles in some small Caribbean nations; this project will advance efforts to put legal protections in place for all sea turtle species in the region in order to replace the harvesting of sea turtles with sustainable eco-tourism. Conduct sea turtle monitoring and conservation activities in the West Indies in close coordination with local community members. Use satellite-telemetry to track the migratory behaviour of hawksbills nesting in the West Indies and use that information to support an environmental education program. Promote sea turtle eco-tourism as an alternative to the harvesting of sea turtles and as a way to build sustainable conservation programs that provide revenue for local communities. A nest monitoring program will be carried out in partnership with local community members in order to involve young people in the collection of important data about sea turtle nesting trends. At least two critically-endangered hawksbills will be tracked using satellite telemetry to further our understanding of the migratory behaviour of this species in the West Indies. 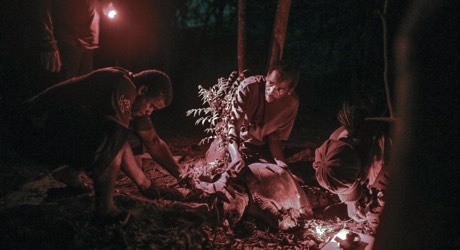 Information about migratory movements will be shared with communities in neighbouring islands to foster greater understanding about sea turtles move between islands and are impacted by laws and human behaviour in each location. 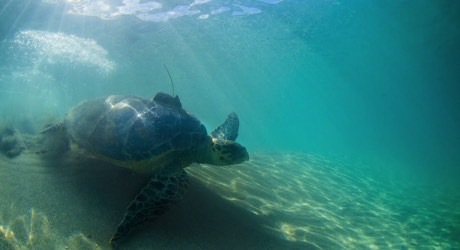 Sustainable eco-tourism will be promoted as an alternative to the unsustainable harvesting of sea turtles. NOTE: There will be opportunities for turtle enthusiasts to assist hands-on with sea turtle conservation at this project location. This project is carried out in close collaboration with local volunteer community members that have organized as the Nevis Turtle Group. STC directly supports this group’s activities with financial support, field supplies and opportunities to participate in cutting-edge satellite telemetry research. The project also offers opportunities for community members to generate income from eco-tourism through the hosting of guided walks to observe sea turtles nesting in their natural habitat. Additional partnerships have been formed with local hotels and resorts, which support the project by minimizing their impacts on the nesting beach and by hosting environmental education programs such as the project’s annual sea turtle summer camp for local school kids. For nearly 60 years, STC has conducted sea turtle research and protection in the Caribbean and Central America. This project fits well with the organization’s long-term strategies and goals for sea turtle recovery. All sea turtle species face considerable threats from poaching, habitat disturbance, marine pollution and interaction with fisheries. These threats are especially prevalent in the Caribbean. In order to systematically improve sea turtle survival, STC must play a key role in collecting important data about sea turtles; training tomorrow’s conservation leaders; and raising broad awareness about threats to sea turtles. This program will help accomplish all these goals.